Cook the small broccoli florets in boiling water with 1 tsp salt until soft (they should be bright green). Drain and set aside. Cook the pasta in boiling water with 1 tsp salt until al dente (follow instructions on the package). Drain and put back in the pot. Melt 2 Tbsp butter and mix into the pasta. In a large skillet, heat the olive oil on medium-high, add the bacon and fry until lightly crisp. Fold a paper towel and put it in the skillet. Move it around the pan with spatula until it soaks up most of the fat. Discard the paper towel. Reduce to medium heat. Add the garlic and fry for 2 to 3 minutes stirring constantly. Add the broccoli and season with salt and pepper. Stir over medium heat for 2 minutes. Add the broccoli mixture to the pasta. Mix well and serve with Parmesan. If you are not big on garlic, use one clove. Also, if you prefer, you can use Pancetta - it's the Italian version of Bacon - you won't have to trim the fat. To cut down on fat, you can sub the 2 Tbsp of butter with olive oil. 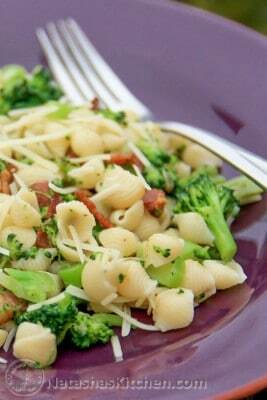 Orecchiette is often used in Italian cooking and would go well with this dish if you can find it.